PURCHASING: KNOW YOUR SOURCE! ALWAYS PURCHASE SEAFOOD FROM A REPUTABLE SEAFOOD DEALER. Fresh fish should have a mild sea breeze odor. A strong fishy or ammonia odor is not acceptable. 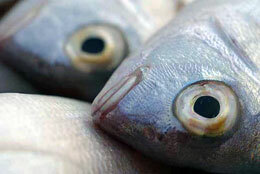 Whole fresh fish should have bright, clear and shiny eyes. Scales should be shiny and cling tightly to the skin. Look for bright pink or red gills. Avoid any fish with sores or lesions on the skin. Steaks and fillets should be moist with firm and shiny flesh. The flesh should spring back when pressed. At the market, make sure that cooked seafood products are not in contact with raw seafood productsin the display case. “Shell on” products such as clams and oysters should be purchased live. Shells of live clams and oysters may gape naturally but will close tightly when tapped indicating they are alive. Live crabs will show some leg movement. Fresh shucked oysters have a fresh odor. A clear slightly milky or light grey liquid should surround freshly shucked oysters. If in doubt about the source of raw oysters and clams, ask seafood market personnel to show you the certified shipper’s tag that accompanies “shell on” products or check the shipper number on the container of shucked oysters. Get seafood purchases home and into the refrigerator as quickly as possible. Don’t leave perishable items in hot cars for extended periods unless packed in ice or in a cooler. It is a good idea to transport seafood in an ice-packed cooler from the store to your home. Keep seafood products cold to keep them safe. Maintain a refrigerator temperature between 34 degrees and 40 degrees Fahrenheit and your freezer at 0 degrees Fahrenheit or colder. You may want to keep your seafood purchase packed in ice in your refrigerator until you are ready to prepare it. Discard ice and wash containers thoroughly after use. This will doubly ensure your food will remain safe, wholesome and delicious. Oysters and clams should be refrigerated in containers covered with clean, damp cloths—not with airtight lids. Use fresh shellfish within one or two days. If you are not going to use your seafood within one or two days of purchase, freeze it. However, do not refreeze previously frozen products. Keep frozen fish and shellfish at 0 degrees Fahrenheit For best quality use them within three to six months. The longer these foods are frozen, the more likely they are to loose flavor, texture and moisture. Refrigerate or freeze leftover cooked foods immediately in moisture proof packages or containers. Always wash hands thoroughly with hot soapy water before and after handling raw seafood. Don’t leave seafood out of the refrigerator for more than two hours, including preparation time and time on the table. Never defrost seafood on the kitchen counter—use the refrigerator, cold running water or the microwave method. Never place cooked food on a plate that previously held raw seafood. Never put cooked crabs in the same basket that came with the live crabs. Always marinate fish or shellfish in the refrigerator, never at room temperature. Discard marinade after use. Wash containers, utensils, knives, plates, cutting boards and other surfaces touched by raw seafood with hot soapy water before reusing them. FINFISH The 10-minute rule is a good guide to cook fish and applied to baking at 450 degrees Fahrenheit, boiling grilling steaming, and poaching only. Measure the fish—whole, steaks, or fillets—at its thickest points. Figure 10 minutes of cooking time for each inch of thickness. Cook a one-inch thick fish steak five minutes on each side. Pieces of fish that measure a half-inch or less do not need to be turned. Add five minutes if the fish is cooked in foil or sauce. Double the cooking time for frozen fish that has not been defrosted. Fish is done when the flesh is opaque and begins to flake easily when tested with fork at the thickest part. You can also check with a thermometer. Fish is usually ready when its internal temperature reaches 160 degrees Fahrenheit. SHELLFISH Shucked oysters and clams become plump and opaque when cooked and ready for eating. The edges of the oyster start to curl. Overcooking can cause them to shrink. Their shells should open when cooked. CRABS Make sure crabs are lively before placing in a pot. Discard any crabs that appear to be dead. The crab pot should have a raised rack a minimum 2 inches high. Add equal quantities of water and vinegar to just below the level of the rack. Layer crabs; sprinkle each layer with a mixture of seafood seasoning and salt. Cover and steam until crabs are red (about 25 minutes). What’s so hard about cooking seafood? Nothing – except, maybe, narrowing down all the preparation options. All you need to know are basic cooking techniques and a couple of tips to ensure success. The standard rule of seafood cookery is 10 minutes per inch of thickness. But this varies, depending on the density of the flesh, whether it’s being cooked frozen or stuffed, etc. You’ll know it’s done when the meat is opaque all the way through and flakes easily with a fork. Also, to ensure even cooking turn under thin ends of fillets so the fish is uniformly thick. Those simple pointers and the advice below are all you need to know to cook seafood like a pro. What to use: all types of fish, lean and oily: fillets, steaks, roasts, whole dressed fish. If wrapped in foil, shellfish can also be baked. What to do: drizzle lean fish with butter or oil. Add cooking liquid like white wine with herbs to keep fish moist. Season as desired and cover. Bake in preheated 350 degrees to 425 degrees F. oven. What to use: Fish fillets or steaks 1-inch thick, or split whole fish. Higher-fat fish like salmon or sea bass works best, as it remains moister. Shellfish option include shrimp, peeled or not; shucked scallops, even oysters, clams and mussels, stuffed or on the half-shell. What to do: lean fish and all shellfish should be marinated first and/or baste during broiling. At the very least, lightly oil the seafood first. Preheat the broiler, and broil fish or shellfish with rack 4 inches from top heat element. Turn fish halfway through cooking. Add fresh herbs toward end of cooking so they won’t burn. What to use: lean fish (fillets, portions, strips, nuggets, even whole, dressed fish); shucked shrimp, scallops, clams; squid rings. What to do: use good quality vegetable oil and keep it at 375 degrees F. Depth of oil in pan should be at least 2 inches. Use a crumb or batter coating on the seafood to be fried. Fry in batches to keep temperature of oil from dropping (this critical in preventing seafood from absorbing the cooking oil). Turn pieces occasionally and cook until golden brown. Fried seafood should be crisp on the outside, moist and tender on the inside. Drain on paper towels. What to use: oily, meaty fish like tuna, swordfish and salmon are ideal. Use steaks and fillets, at least 1/2 inch thick, or whole, dressed fish. Skin-on filets work nicely, as they hold together well. Grill large shell-on shellfish or shucked shellfish on skewers. What to do: marinate or season seafood as desired. Drain marinated seafood well before grilling, reserving marinade for basting. Oil grill surface well to prevent sticking. Grill topside down first; turn, baste and finish cooking with skin-side down. Lay skewered shellfish directly on grill. Baste often while cooking. What to use: lean fish – fillets, steaks or whole especially benefit from the moist cooking technique. Avoid poaching oily, dark-meated fish like mackerel or tuna. Salmon is exception here. What to do: select a cooking liquid – water, broth, wine, milk, etc. and season to taste. Use a big enough pan and enough liquid to cover the fish. Bring to a boil, reduce heat to simmer and add seafood. Simmer, covered, till done. Use remaining liquid to make sauce. What to use: small, whole, pan-dressed fish, like trout; thin, skinless, like flounder; thin steaks, shellfish: shrimp, peeled or not; soft-shell crabs; shucked scallops; squid. Oily fish like mackerel or salmon don’t lend themselves to this technique. What to do: sautéing is essentially frying, but in a small amount of fat. If desired, first dredge seafood in seasoned flour, shaking off excess. Melt enough butter or margarine to just cover the bottom of the pan (adding some olive oil will prevent butter from burning). Heat fat over moderate heat. Add seafood and sear, then lower heat to finish cooking. Turn so seafood browns evenly. What to use: all lean fish: fillets, steaks, small whole fish. All shellfish. Oily fish do not benefit from steaming. What to do: steaming is done in tightly covered container in which seafood is placed on a rack – with or without a bed of vegetables – over boiling water or other liquid. In the case of clams and mussels, the shellfish are placed directly into a small amount of liquid in a covered pan and cooked at high heat until they open. Steaming is recommended over boiling for lobsters, since they don’t become waterlogged. Are your lump crab cakes precooked before shipment? Our Jumbo Lump Crab Cakes are not precooked before shipment. They are made fresh the morning of the shipment and then shipped in a box with gel packs. Included in your package is cooking directions and our recommendations of how best to prepare them. Hope to hear from you soon!